Okay so the roses aren’t in bloom, but you get the jist. I was sitting here finishing Christmas cards. package wrapping and last minute gifts and all afternoon I saw a different sky every time I looked up. I finally grabbed my camera and phone and went to take pictures for here and Instagram. 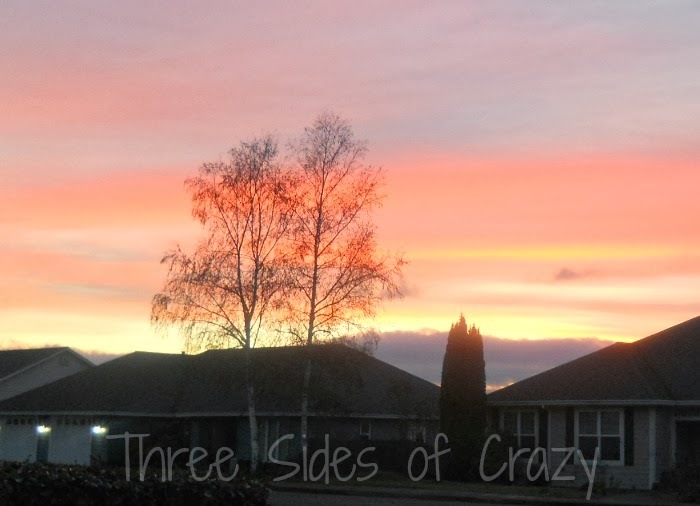 Even though I took the pictures one right after the other I got two entirely different skies. That was when it occurred to me that even at this time of year when it is so easy to get so busy that we forget the simple things that it’s this time that is exactly when we need to remember the simple things. Life has been crazy. I know, I know it’s the holiday season and we’re all busy. BUT, the storm that hit yesterday really made me take stock since hubby is home fresh from the hospital recuperating from foot surgery and ACTUALLY NEEDS a nurse so I’ve been sticking close to home and reevaluating my TO DO lists. There was a craft fair I wanted to go to at the local fairgrounds though and I thought I’d give it a couple hours. I got him all settled with plenty of snacks, a phone, etc… and decided to head out. After all, the storm was over and the sun was HUGE in the sky and bright. That was the good news and the bad! The sun was melting the snow, but the temperature was only beginning its climb to 25 which was short lived to begin with and felt like 10 with the wind chill so the slush was fleeting as it became ice. I thought the freeway would be better since they had supposedly cleared it for the truckers, but that was a bust too. I got off on the first off ramp and headed back home which I know was the right choice since I encountered a broken down snow plow, 2 vehicles in ditches and several others who had NO idea to drive on the ice and were in the wrong vehicles, or at least the wrong tires to do so. 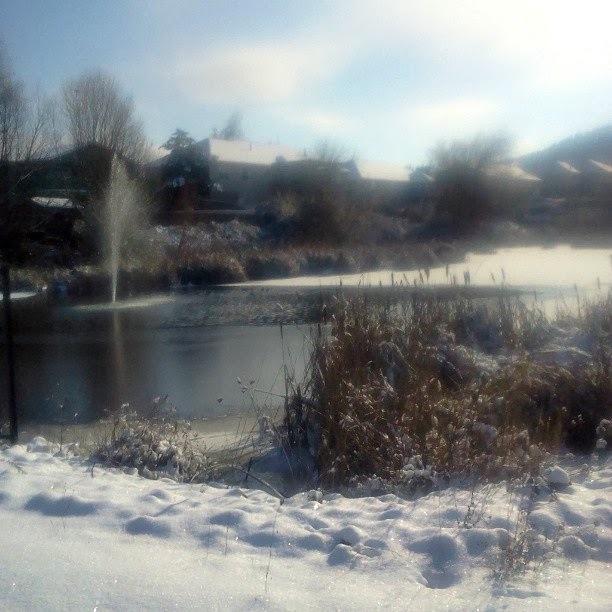 I did however get a great picture of the duck pond behind my house and it’s one of my favorite shots of the season. There are still several ducks in it despite the fact that the ice and snow are winning the war on covering the surface.